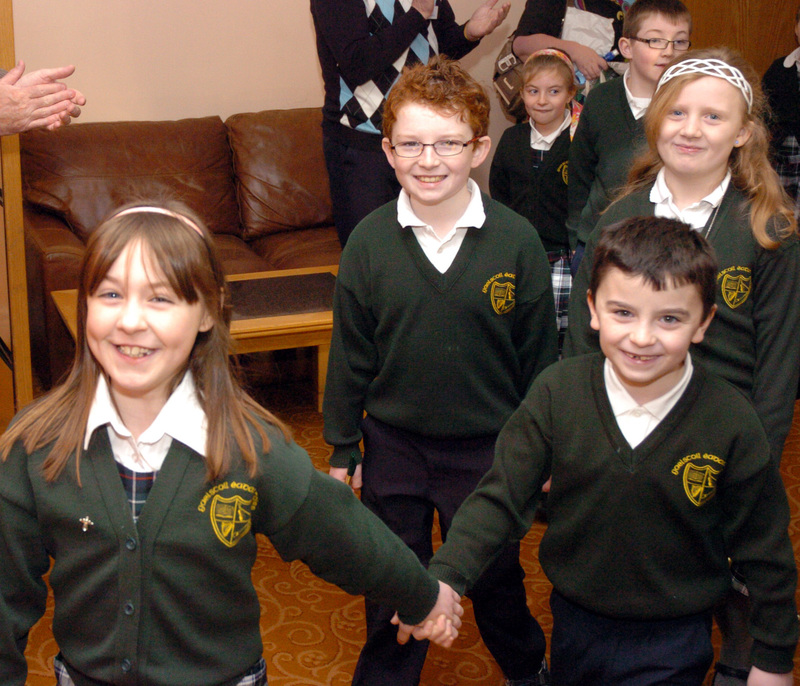 Gaelscoil Éadan Doire was founded in 2008 with 21 children and two teachers. The opening of the school doors for the very first time on the first of September proved to be a very joyous and proud occasion for everyone involved, and the school has come on in leaps and bounds since then. The Department of Education and Skills granted the school permanent recognition from the first of September 2011, and GAELSCOILEANNA TEO. would like to congratulate the school community on their success. We wish Gaelscoil Éadan Doire all the best for the future! PARENTS whose children attend a prestigious all-girls school are claiming over half the total Department of Education’s remote area grant scheme. The scheme was designed originally for islanders and those unable to access second level education in their locality. However, the main beneficiaries of the scheme are the parents of students at Coláiste Íde, the all-Irish country house-style boarding school in Dingle, Co Kerry. The majority of the 142 students at the school are able to avail of the grant towards their fees. The grant, not means tested, offers up to EUR5,000 euro per student, according to figures released to Radio Kerry. The grant scheme, administered by the department, was introduced in 1967 with free post-primary education and was designed to give pupils from islands and other remote regions an opportunity to be educated. The grants are based on distance and pupils who live over 25km from “suitable free education”. Coláiste Íde is the only all-Irish boarding school in the State and is in demand among second-level children who had their primary education in Gaelscoileanna. According to figures obtained by the local radio station, 99 of the 142 students in 2010 at Coláiste Íde qualified for the grant aid and drew down a total of EUR472,375. Over the past five years, parents of boarders at the school have qualified for over EUR1.9 million in state aid to cover the fees. This was over 50% of all monies paid out by the Department of Education under the grant, which was paid in respect of pupils at 26 other schools since 2006. The EUR836,876 total cost of the scheme last year included payments relating to 14 other schools – six in Cork, four in Mayo, three in Galway and one in Donegal – and the next highest payment was EUR163,251 for students at the all-Irish Coláiste an Phiarsaigh in Glanmire, Co Cork. A spokesperson from the National Parents Council has called for a review in the light of special needs cutbacks affecting most schools. Coláiste Íde is housed in an elegant Georgian home on the shores of Dingle Bay on almost 110 acres of park and woodland. It offers stables and other facilities. Yesterday, a spokeswoman for Coláiste Íde said what parents claimed was not a matter for the school. However, the grants did not cover 100% of costs as the fees at the school were EUR6,000 in addition to other costs, the spokeswoman said. The PDST is a cross-sectoral support service established by the Department of Education and Skills to provide professional development support to primary and post-primary teachers and principals/school leaders on a wide range of educational topics. The PDST currently has a number of full time secondment opportunities for the position of regional advisor. A panel may be formed from which future vacancies at regional advisor level may be filled. For full details on job description and application form please refer to www.pdst.ie. The closing date for applications is Thursday 3rd November 2011 at 5.00pm. Dráma a rachaidh go dtí an croí ionat… Heart-wrenching and haunting theatrical experience presented by Splódar. Ceann de mhórshaothair Brian Friel. Friel’s masterpiece is surely the Romeo and Juliet of Irish literature as the illstarred lovers find societal and family pressure too much for them. Mag agus Joe a bhfuil an bás i ndán dóibh. Ach tá níos mó den ghreann agus den scléip sa saothar seo ná mar atá i ndráma Shakespeare. Strangely, this tale of tragedy with hilarious humorous sequences awakens feelings of optimism rather than despair and draws us deftly into the charged and changing world of the young lovers. Experience it in Irish, the language of love. See Neasa Ní Chuanaigh and Iorras Ó Gallachóir as the ill-starred lovers. Hear the beautiful vocal backing of composer Ailie Blunnie and Anúna soprano Aideen Rickard. Dráma cumasach! Dráma den chéad scoth! Bígí ann! Dráma na Bliana. Léiriú na Bliana! DULEEK chess champ Una O’Boyle can now extend her Wonder Woman status beyond voicing the character on TG4, as her Irish chess book ‘Ficheall’ has been short-listed for Irish language Children’s Book of the Year (Gradam Réics Carló) 2011. Called ‘Ireland’s Queen of Chess’, the chess Olympiad and Women’s Candidate Master teaches the game in local Gaelscoil Scoil Aonghusa, and the book – the first ever as Gaeilge – is the culmination of five years’ work, which saw Una having to create whole new words for chess terminology. ‘I can’t actually believe I made the shortlist, but am absolutely delighted,’ says Una, who learned the art of the game from her late father Enda. ‘Chess players are a gorgeous bunch of people and I love seeing the children chatting away about chess in Irish as though it were the most natural thing in the world.’ Her late dad’s passion for the game rubbed off on Una, and she was something of a child prodigy. 500 students from post-primary schools in the Northwest attended a careers information seminar, ‘Buntáiste Breise na Gaeilge’, which was organised by Comhdháil Náisiúnta na Gaeilge last week. Teachers and students alike heard guest speakers discussing the advantages which the Irish language affords young people when choosing their careers. TG4’s renowned sports presenter Mícheál Ó Domhnaill spoke about the advantages that Irish gave him when he went to live in Spain and began to learn Spanish. Ironically Micheal landed a post which required both Irish and Spanish when he started reporting on the Spanish league games on TG4. Barbara Nic Dhonnacha PPI’s Music Broadcaster of the Year 2011 spoke about the skills she learned and the challenges she overcame since she first started broadcasting. Barbara gave a wonderful account of her interesting job as a bilingual broadcaster on iradio. Translation, drama, culture and traditional music were the topics under discussion by Athlone born Freda Nic Giolla Chatháin. Freda gave a great account of all the various opportunities the Irish language gave her and also spoke about the various travel and interview opportunities which her career gave her over the years as a translator. Ciarán Mac an Bhaird who is a lecturer in business and management in Fiontar DCU gave an inspiring insight into this own experience with the Irish language as a non-fluent speaker. Ciarán gave an insight into the various options students have regarding careers if they are capable of speaking Irish. He encouraged the audience to embrace the language. Ross Ó Snodaigh an accomplished musician with the world renowned band Kíla who hails from Dublin focused on his own experiences travelling all over the world as a musician and encourages students to embrace the language and speak it on a daily basis and told them that it was up to them to speak the language to keep it alive in the future. In Carrickmacross on Wednesday morning at a similar seminar Gráinne McElwain who hails from Ballanode, Co Monaghan gave a wonderful insight into the advantage of Irish in the field of media and television and the role of TG4 and other independent companies as an opportunity. Gráinne discussed the role of the Irish language in her line of work and her work as a presenter on programmes such as Rugby Magners league Health Squad, Seó Spóirt on TG4 and Loach Gael. Réamonn Ó Ciaráin from Armagh provided the students with an insight into the wide range of careers which can be achieved with the Irish language. Réamonn gave an account of his interesting work with Gael Linn in Ulster and the challenges he encounters on a daily basis. Having worked in a library in Co. Cavan for twelve years Carmel Cusack Smith had many years of experience in dealing with the public and providing an Irish language service in a non Irish language speaking area. Carmel outlined the challenges that came with building a gaelscoil in Cavan and also her challenging role in organising local events and also her work with Fleadh Ceoil na hÉireann. Representatives from various third level institutes were also present with information stands and they distributed information regarding Irish Language third level opportunities available to those wishing to pursue their education through the medium of Irish. Congratulation to Gráinne Carty from Pobalscoil Naomh Attracta who won the first prize €425 scholarship for a Gael Linn summer college at the event in Carrick-on-Shannon and to Fionnuala Ní Chathmhaoil from Choláiste Oiriall who won €425 for a Gael Linn scholarship at the event in Carrickmacross. Comhdháil Náisiúnta na Gaeilge has being organising these seminars for almost three years now and the sixteenth seminar of its kind will be hosted in Dungarvan next month and so far the seminars have catered for 4,300 secondary school pupils around the country. Comhdháil Náisiúnta na Gaeilge are very grateful to all our sponsors who sponsor great prises for these seminars: Gael Linn, Coláiste Uisce, RTÉ Raidió na Gaeltachta, Freedom Surf School in Tramore.